Famous actor Kwon Sang Woo of the Republic of Korea (RoK) will visit Ho Chi Minh City this July. On a short-day trip to the country, Kwon Sang Woo and Nguyen Thu Hoai, former Mrs Vietnam Continents for 2012, will participate in an exchange and sign a cooperation document. Kwon Sang Woo will then be a special guest at a birthday celebration themed “Night of beauty” for a beauty salon in Ho Chi Minh City on July 21. Kwon Sang Woo, 42, established himself in RoK’s entertainment industry after acting in the “Volcano High” movie which was released in 2001. A few years later, he drew more and more fans while being cast in many big film projects. In 2004 Kwon Sang Woo found fame once more after acting in “Memories of Paradise” with well-known actress Choi Ji Woo. 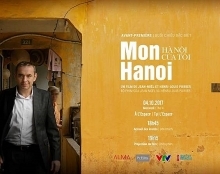 The movie was popular with audiences in Vietnam and the whole of Asia. The 42-year-old Korean star is married to Son Tae Young, second runner-up of Miss Korea 2000. They have two children.